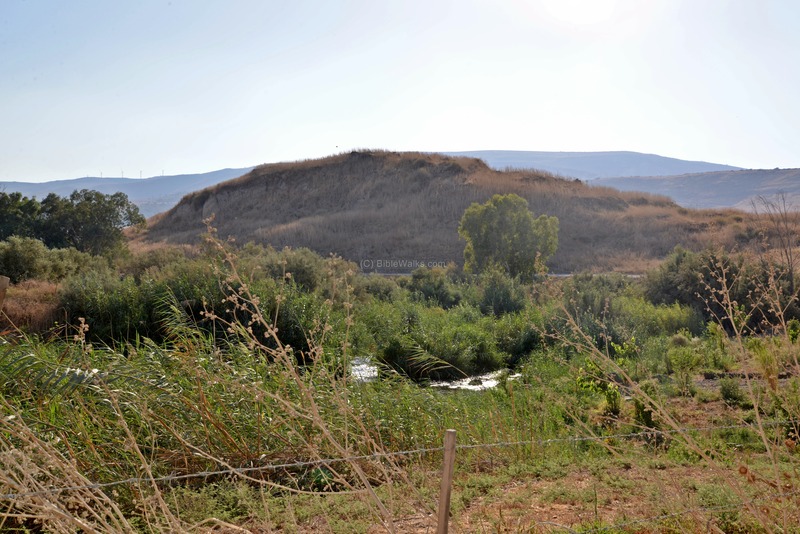 A walled Biblical city on a mound near the Jordan River. Nearby, a major prehistoric site with earliest remains of Early man outside Africa. 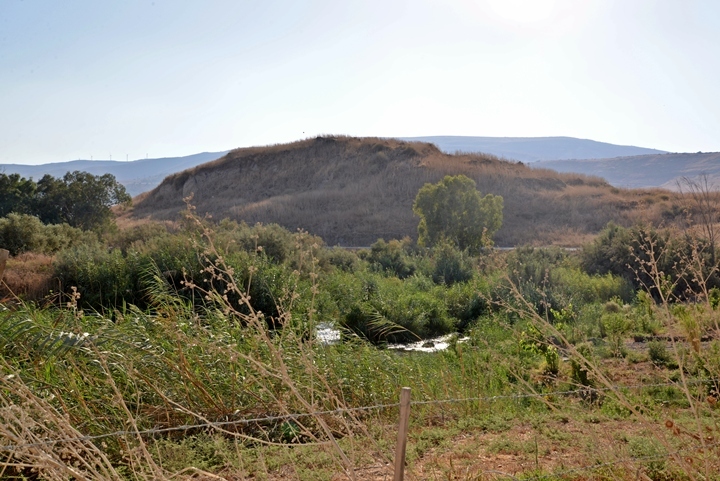 Joshua 19:22: "And the coast reacheth to ... Bethshemesh; and the outgoings of their border were at Jordan..."
Ubeidiya is a major archaeological site located near the Jordan River, 3KM south west of the Sea of Galilee. Remains of Early Man were identified near the mound, and are one of the earliest settlements of Homo Erectus (an early Human specie) outside of Africa. 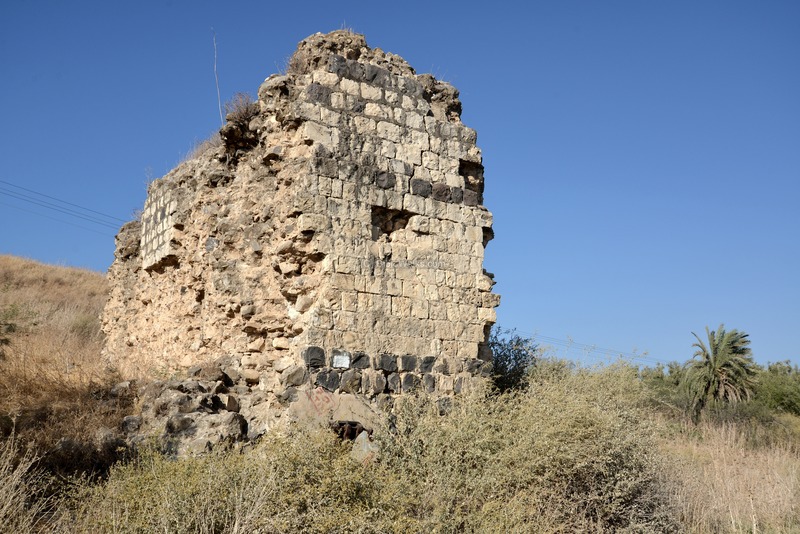 On Tell Ubeidiya was a walled Biblical city, perhaps Beth Shemesh ("house of sun") of the Galilee. Some clerics regarded this area as "the garden of Eden". An aerial map is shown here, indicating the major points of interest around the site. The mound is located at a height of -215m. The minus sign indicates under sea level, as it is in the great Jordan valley Syro-African depression - the lowest place on Earth. 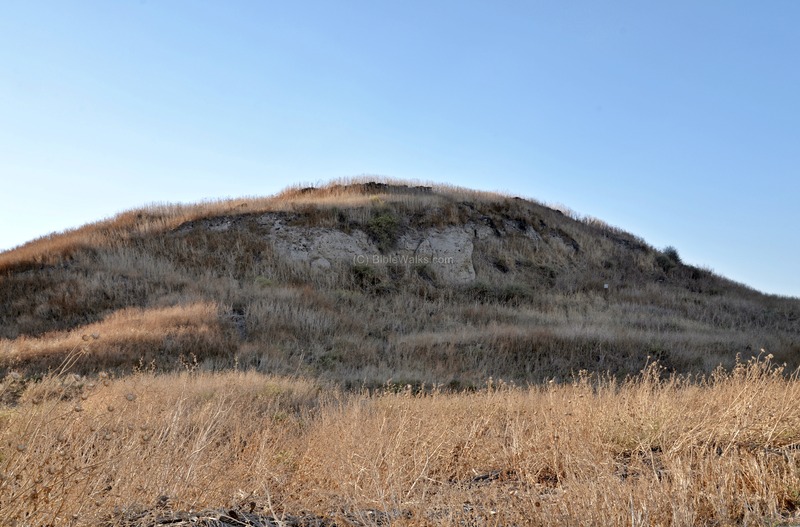 The mound is about 15m above the Jordan river which flows, from north to south, on its east and south sides. The slow flowing shallow river created an "island" on the south side and also on the east side near Kibbutz Beit Zera. The famous prehistoric site of Ubeidiya is located nearby on the north west side. One of the important events is the split of the Hominines (pre human subfamily) to a human branch and to chimpanzee branch, which occurred at about 4 Million years ago. The oldest form of human man (named Australopithecus) had evolved by the Early (Lower) Pleistocene period, spanning 2.588 to 0.781 Million years ago. 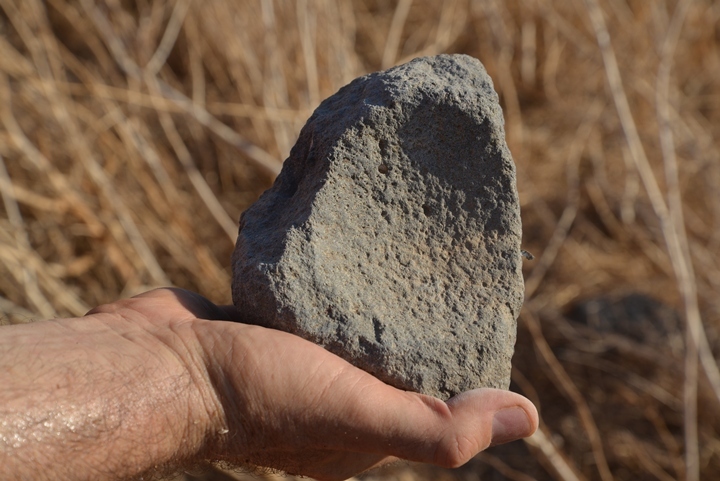 The archaeologists classify the cultures at this time as Paleolithic (meaning: old stone age). Homo Erectus ("Upright Man", see illustration on the right) evolved in Africa at 1.8 Million years ago (Ma). This early human specie is similar to modern humans, but with 74% of the modern human brain size. They controlled fire by about 1.5 Ma. This specie lived more than a million years and was the first to live in a hunter-gather society. Homo Sapiens (our species) evolved in Africa in about 250,000 years ago (0.25 Ma). They moved through the Levant to Europe only at about 120,000-100,000 (0.12-0.10 Ma) years ago. The cave of Gedi (es-Skul) on Mount Carmel has remains of that period. In the Middle Paleolithic period (80,000-40,000 years ago) they knew how to make knives, scrapers and points out of flint. They coincided with another specie - Neanderthal (a specie that eventually disappeared about 30,000 years ago). Another site with remains of this period was on Mt Precipice near Nazareth. Few out-of-Africa early Hominine sites were found to date, such as Ubeidiya-Israel (1.6-1.2 Ma) and Dmanisi-Georgia (1.7-1.9 Ma remains). Therefore, this rare site was a major research of archaeology, history, geology, faunal (animals) and environment studies. The site is a key to understand the exact time this early man migrated from Africa to Europe. The prehistoric site of Ubeidiya is located 200m west of the mound of Tell Ubeidiya, on the banks of Nahal Yavne'el. The excavations identified 60 layers, Homo Erectus bones, mammal bones (120 types) and more than 10,000 ancient tools. Use of fire was not identified at the site. The findings, starting from 1.4 Million years ago (Ma), is the earliest site of Homo Erectus found outside Africa. The geology of this area also changed considerably since the early settlement, as the ground level inclined by 70 degrees due to the tectonic and climate shifts, and an ancient lake once bordered the site. On Tell Ubeidiya was a walled Biblical city, located on a high mound east of the prehistoric site. Its natural defense of the Jordan river surrounding parts or all sides of the mound, and the strategic location on one of the main thoroughfares of the ancient times, made this city strong and wealthy. Some clerics regarded this area as "the garden of Eden". The place is indeed blessed with abundant supply of water, good soil, and sun most of the year. Beth Shemesh? A scholar, Pinhas Neeman, identified the city as Beth Shemesh ("House of Sun") of the Galilee (Joshua 19:17,22): "And the fourth lot came out to Issachar...And the coast reacheth to Tabor, and Shahazimah, and Bethshemesh; and the outgoings of their border were at Jordan: sixteen cities with their villages". The "House of Sun" is a name of other Biblical places, such as Beit Shemesh in the south. The Canaanite city may have been named Ir-Shemesh ("Sun City") as its people may have worshipped the sun. Another Canaanite city 3 KM to the north worshipped the moon (Beit Yerach), as did Jericho (their names are based on the Hebrew word "Yerach" meaning 'moon'). The practice of sun worship was common in ancient times, and the Bible warns against it (Deuteronomy 4 19): "And lest thou lift up thine eyes unto heaven, and when thou seest the sun, and the moon, and the stars, even all the host of heaven, shouldest be driven to worship them, and serve them, which the LORD thy God hath divided unto all nations under the whole heaven". There were several cities named after the sun or the moon, and the practice was common even later during the period of the Israelite Kingdom (2 Kings 23 5): "And he put down the idolatrous priests, whom the kings of Judah had ordained to burn incense in the high places in the cities of Judah, and in the places round about Jerusalem; them also that burned incense unto Baal, to the sun, and to the moon, and to the planets, and to all the host of heaven". The cities and roads during the ancient periods, up to the Roman period, are indicated on the Biblical Map below. The site, marked as "Beth-Shemesh", is on the path of a major south/north ancient road, depicted as a grey dashed line south of the Sea of Galilee and west of the river (a blue line flowing down). Remains of a section of the Roman road from Beit Shean to Tiberias were found on a trial excavation on the western side of the mound, about 200m from the Jordan river, on the side of a agriculture road. Findings also included Hellenistic and Roman period coins and pottery shreds. A detail of the Peutinger map (Peutingeriana tabula), based on a 4th C map of Imperial Roman roads, is here on the right. It is oriented with the top side as the west. The map shows the major military roads between Jericho (on the middle left, named here by its Roman name - "Herichonte"), though Beit Shean ("Scytopoli") to Tiberias ( "Tyberias") above the icon of the Sea of Galilee. The distances are marked with Latin numbers, being XXIII (which means 23 Roman miles, or 35KM, between Beit Shean and Tiberias). 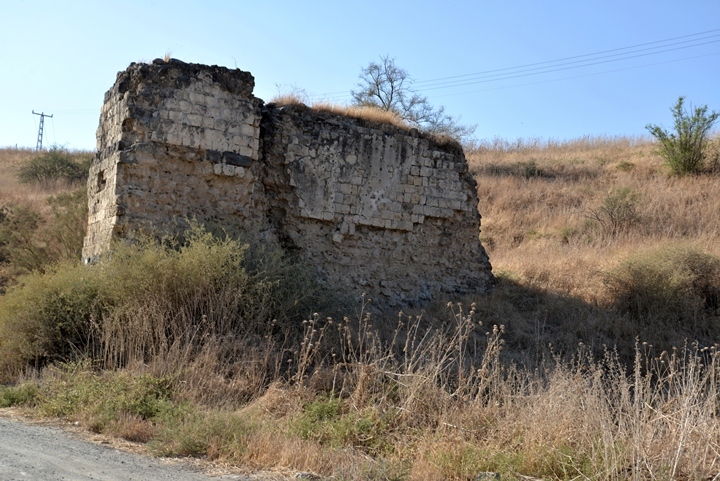 During the late Ottoman period a small village (El 'Abeidiyeh) was located on and around the hill. "El 'Abeidiyeh - Stone and mud houses, built on a round tell, close to the Jordan river. It contains about 200 Moslems, and the plain is cultivated. There are several mills in the neighborhood. There are a few small palms, but not many trees, round the village". 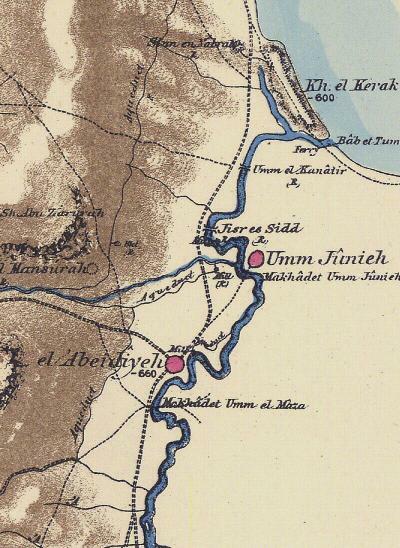 The Arab village of El 'Abeidiyeh was inhabited by former slaves from Africa, which was the basis of its name (the village of slaves). This was explained in the PEF dictionary (names list of sheet VI, p. 121): "El 'Abeidyeh. from 'Obeid', 'a little slave' (but perhaps connected with the Biblical name Obadiah). The village was deserted in 1948, and the only visible remains is a wall of the old mill. 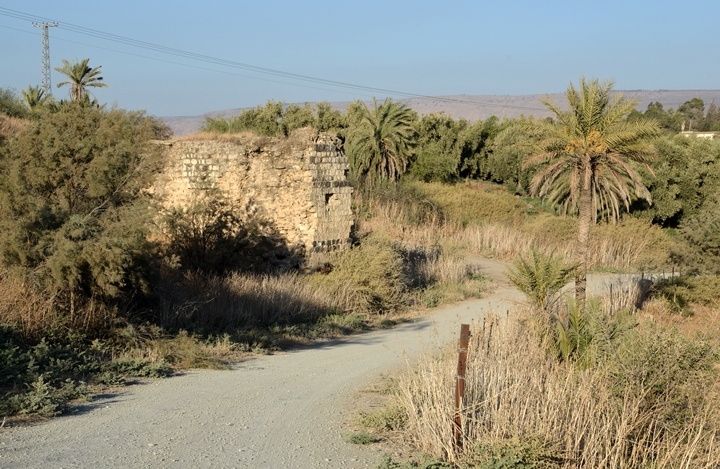 Another point of interest is the village of Umm Junieh (p. 362), where Degania was later established (1909) and became the first Kibbutz (communal settlement) in Israel. "Umm Junieh: A stone and mud village on the east side of the Jordan, on the top of the eastern bank of the river ; contains about 250 Muslims. The plain round is arable soil : no trees. A mill is worked at the village". 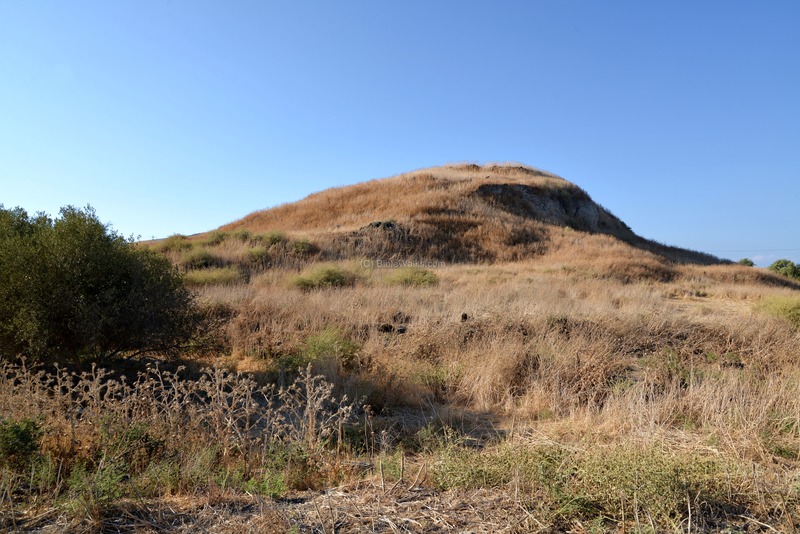 The modern Hebrew name of the site is "Tel Ovadia", meaning the mound of Obadiah (a Biblical prophet during the times of King Ahab). The prehistoric site was discovered "by chance" in 1959, when surface finds of stone tools and bones were found near the mound. They were initially dated to the Early (Lower) Pleistocene period. This exciting find started a series of extensive archaeological excavations at and around the site, spanning 40 years. Excavations were conducted in 1960-1966 (headed by M. Stekelis), 1967-1974 (O. Bar-Yosef and E. Tchernov), 1988-1994 (E. Tchernov and C. Guerin), 1997-1999 (J.J. Shea, G. Bozinski and O. Bar-Yosef ). Excavations at the prehistoric site exposed material culture from the Early Paleolithic period, starting at 1.4 Million years ago. Excavations on the mound revealed remains from the following periods: Early and Late Bronze, Iron, Persian, Roman, Byzantine, Early Islamic, Crusader, Mamluke and Ottoman. The area is now covered by metal sheets and weed, and is not open for tourists. Some of the findings can be seen in the Degania Aleph museum (Beit Gordon). The site is in an open public area (National Park), and is easily accessed by road from Beit Zera, a Kibbutz founded in 1927. 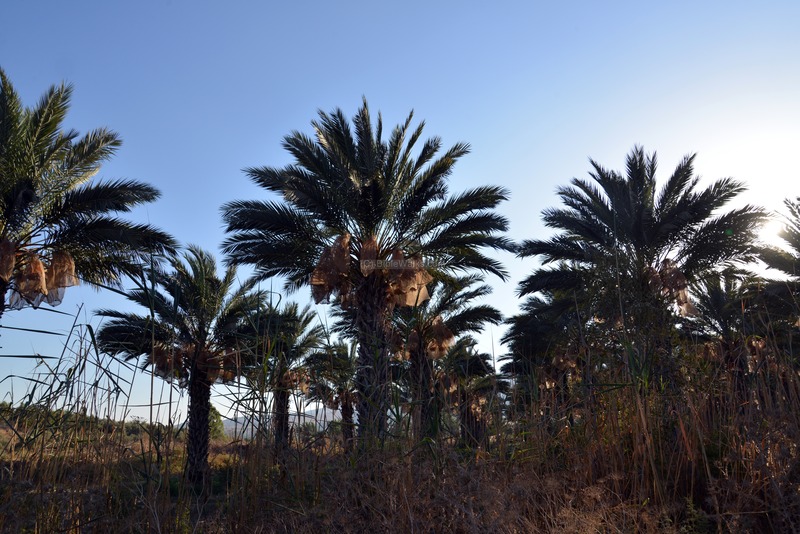 The picturesque place, on the banks of the slow flowing Jordan and surrounded by palm trees, is indeed a "garden of Eden". A view of Tel Ubeidiya was captured from the south side by a drone. 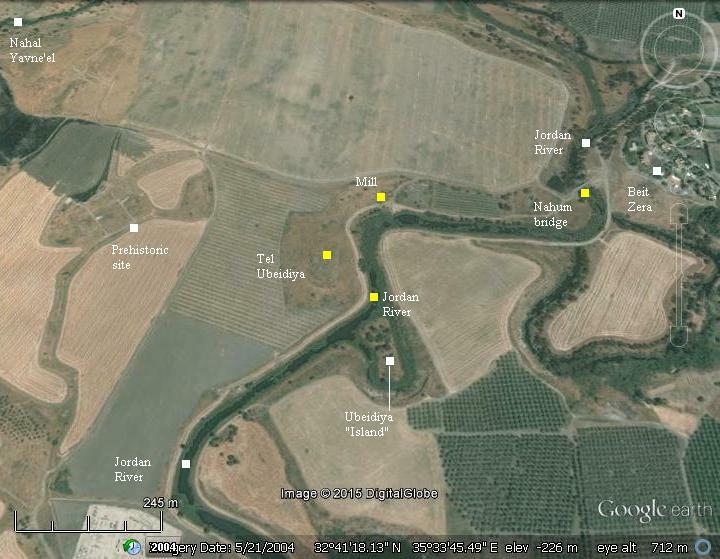 The Jordan river loops around the east and south sides of the mound. The prehistoric site is seen to the far left (west) of the hill. 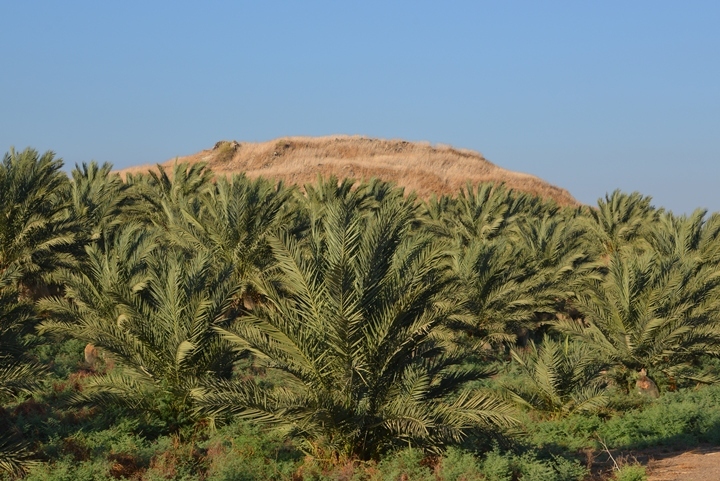 Remains of the Biblical city are located on top and around the mound. 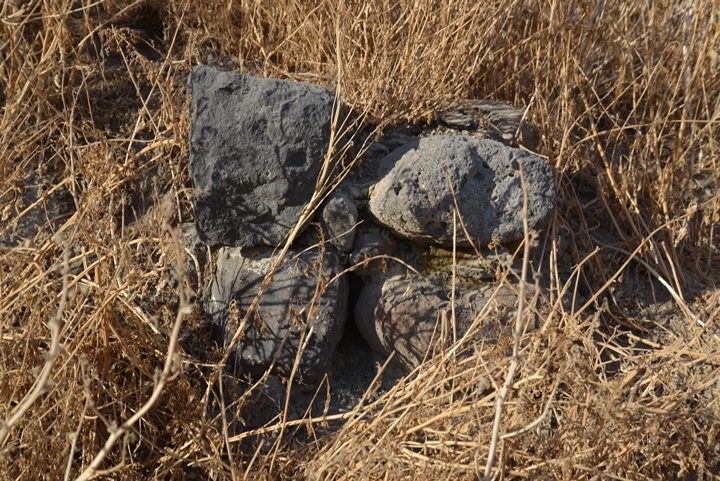 It is seen here from the north east side, on the west bank of the Jordan river. Another view, from the south side, is seen in the following photo. The east side of the mound is cut, revealing the composition of its soil. During the summer the hill is covered with dry brushes, making it difficult to see what lies on the ground. Also, snakes make it risky. We dared only to ascend the south side in order to nearly reach the summit. However, on the way up we noticed traces of walls made of crude hewn fieldstones typical of the Bronze and Iron age periods. 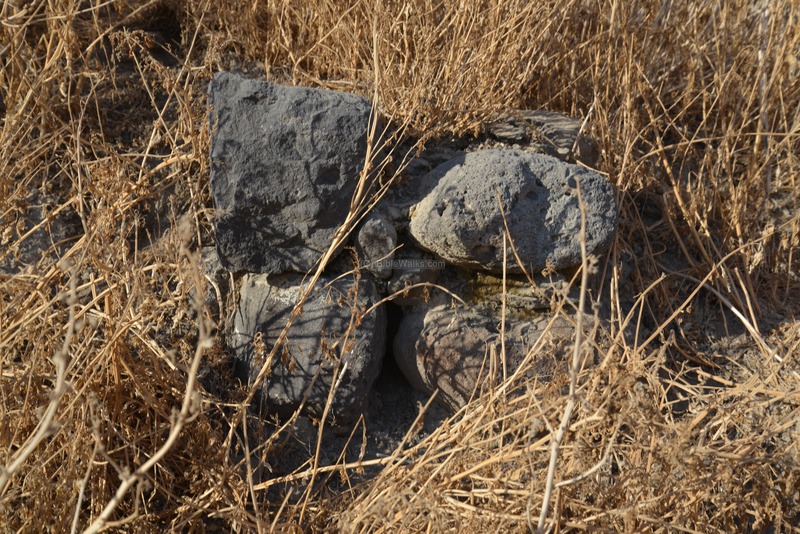 However, we could notice a fragment of a man made basalt stone bowl. 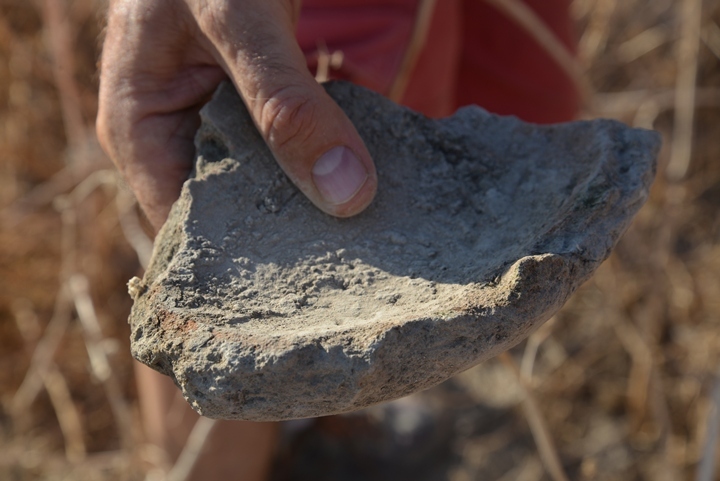 We also observed a fragment of a large (30cm diameter) and thick (2.8cm) ceramic bowl. During the late Ottoman period (19th-20th Century) a stone and mud village was located on the mound. The village's residents were former African slaves, which is the source of the name of the village (Ubeidiya in Arabic means village of little slaves). The only noticeable remains is this wall, remains of a water mill standing north of the mound. This flour mill operated on the power of water. The water was fetched from the Yavne'el stream via an aqueduct, and due to the altitude differences the force of the falling waters turned wheels that crushed the grains into flour. The shallow and slow flowing river passes at the eastern foothills of the mound. Above on the edge of the cliff is a memorial observatory place named after the late Mussa (Moshe) Lahav, a farmer of Beit Zera. A great place to relax and take pictures of the "island" of Ubeidiya, created by a changing course of the river. 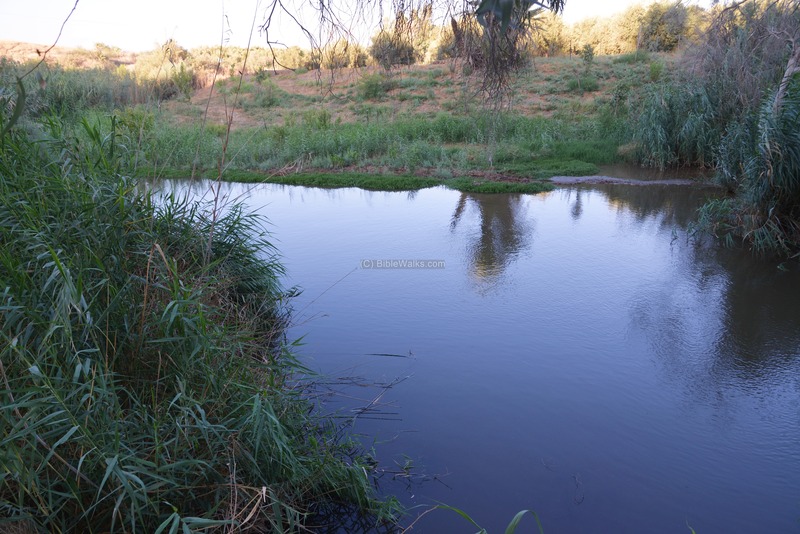 Although the Jordan is regarded as a river, here it is a narrow stream. 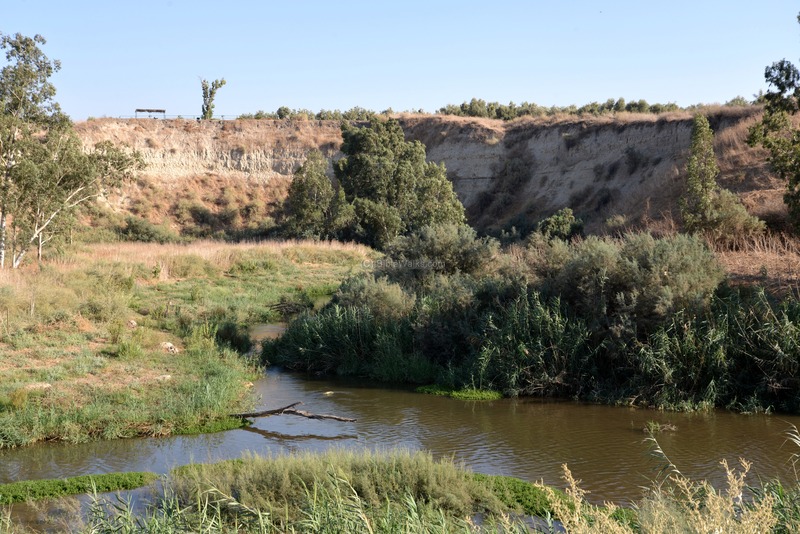 The outlet from the Sea of Galilee was blocked in modern times in order to supply water to the south of Israel and to the nearby state of Jordan, which minimized the flow down the Jordan valley. A convoy of a dozen off-road vehicles passed near the mound. 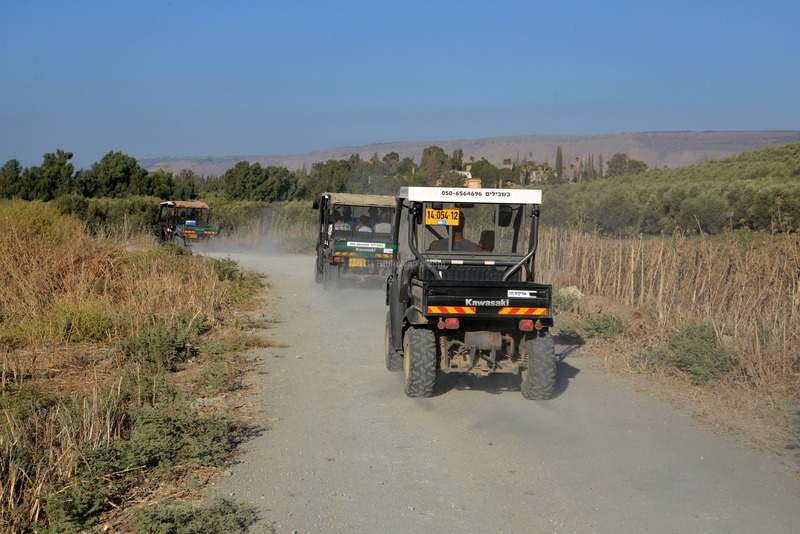 You can join such tours by contacting the company ("Bashvillim") who organize tours on 4x4 vehicles along the river. The Nahum memorial bridge is located closer to the Kibbutz. 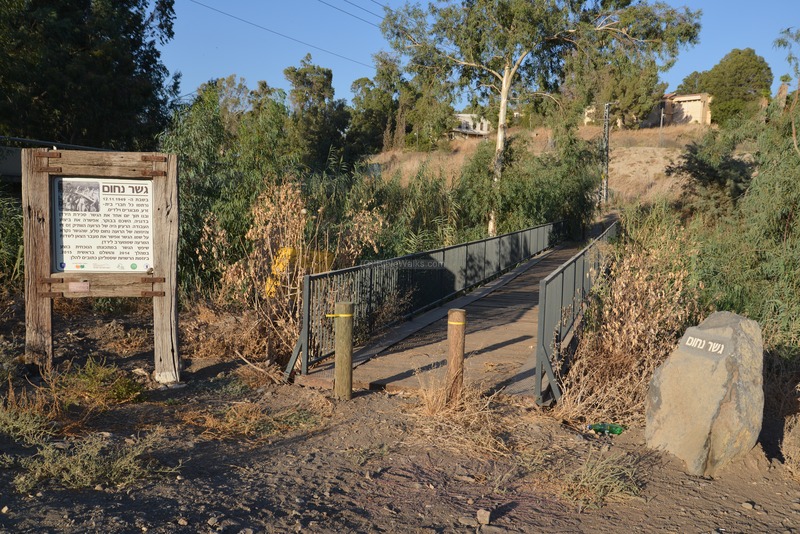 It was reconstructed in 2014-2015, as part of the Jordan valley rehabilitation project, on the site of the old wooden bridge. The sign records the event in January 12, 1949, when the Degania dam on the south side of the Sea of Galilee blocked the flow of the Jordan river. Then, the members of Kibbutz Beit Zera, lead by Nahum Sela, built within that day a bridge over the river in order to let the livestock to cross the river to the west side. We bring here two local types of trees in juxtaposition - a blessed tall tree that provides food and shelter (the date palm tree), and on the other hand a loathed low and underground "tree" (the Dwarf Mesquite). Date palms are one of the main sources of agriculture income of the settlements of the Jordan valley. Large areas are planted with the palm trees. 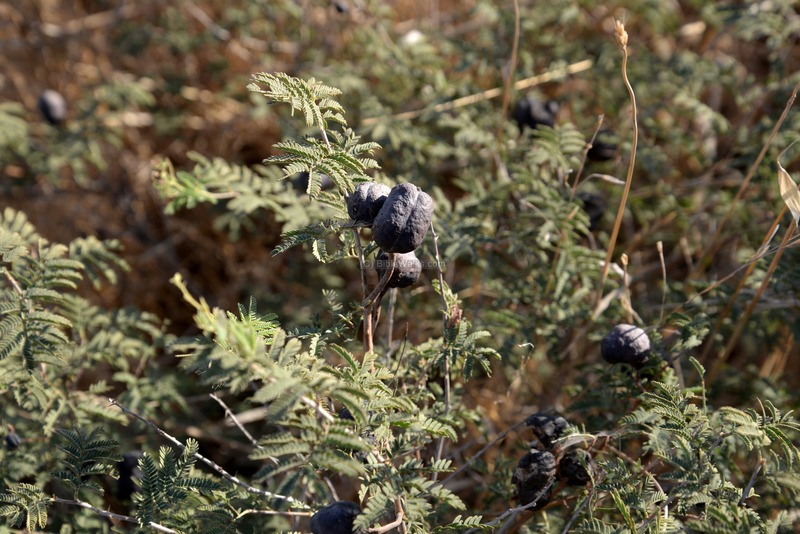 The Bible has numerous praising references to this blessed tree, such as (Psalms 92 12): "The righteous shall flourish like the palm tree"
The next photo shows a thorn with dark fruits, which look like beetles. It is is one of the typical low bushes here. It is called "Dwarf Mesquite" (Prosopis farcta). In Hebrew it is called "Yanbut Hasadeh", based on the Arabic name, as the plant drills down into the ground. This is actually an underground tree, with thick deep roots reaching ~8m and thin roots reaching up to ~25m. The leaves above the ground are up to 0.3m, hence the prefix "dwarf". It loves sun and enjoys the dry valleys, and in the summer it has small yellow flowers. It is almost impossible to get rid of, so farmers and homeowners loath this stubborn bush. A Biblical reference can be found in Isaiah 7:19: "And they shall come, and shall rest all of them in the desolate valleys, and in the holes of the rocks, and upon all thorns, and upon all bushes". Tell Ovadya, Ovadiah, Obadiah - Hebrew for "servant of God". A prophet in the 8th Century BC (Obadiah 1:1): "The vision of Obadiah. Thus saith the Lord GOD concerning Edom; We have heard a rumour from the LORD, and an ambassador is sent among the heathen, Arise ye, and let us rise up against her in battle". The prophet served Ahab (1 Kings 18: 3-7): "And Ahab called Obadiah, which was the governor of his house....".